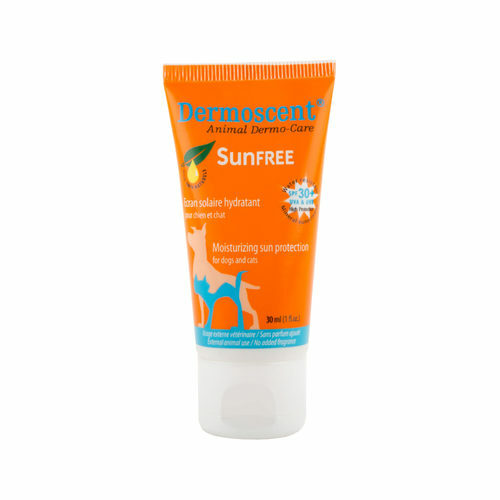 Dermoscent SunFREE is a skin friendly, SPF 30+ sun cream for dogs and cats. It helps protect sensitive and light-haired skin from sunburn. The sun cream is waterproof and perfume-free. Dermoscent SunFREE is a skin-friendly and zinc-free SPF 30+ sun cream specially developed for dogs and cats. The cream moisturises the skin and helps protect it against dehydration caused by exposure to the sun. The sun cream contains a UV filter of titanium oxide and aluminium oxide, as well as natural Candelilla wax. This makes the sun cream suitable for dogs and cats with sensitive skin. Use especially in areas where the dog or cat has little or no fur and/or in places where the skin has less pigment, such as around the edges of ears, around the nose, the inner thighs, abdomen and areas of scarring. It is recommended that you apply the formula all over for cats and dogs with a light coat and/or sensitive skin. Dermoscent SunFREE can be used for up to a year after opening. Have you used Dermoscent SunFREE for Dogs & Cats before? Let us know what you think about this product. Looking after stray cats in Greece this product is great for sun protection of the cats with pink ears. I had been looking for a sunscreen that was pet safe and found this among the limited choice. I am happy to have a pet friendly product, but it still stains my pet's ears as other 'normal' sunscreens and is quite expensive for such a small bottle. As long as it products my cats, thats the main thing.